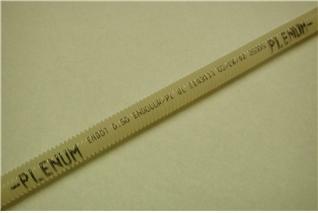 Sizes ½", ¾", 1", 1 ¼", 1 ½", 2" - ALL with UL Listed pull line. A variety of packaging options, from 250' coils to 96" reels. 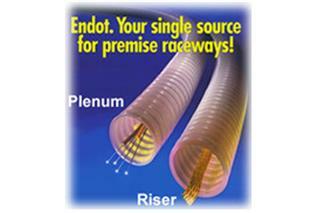 Endocor/PL Plenum Raceway is ideal for installations requiring plenum or riser-rated materials. Endocor/PL not only meets test method UL-910 for fire and smoke characteristics, it exceeds it! Manufactured of PVDF, our plenum raceway provides a very clean, extremely-low friction path for installation of cable in building environments. If you want the best, take the first. 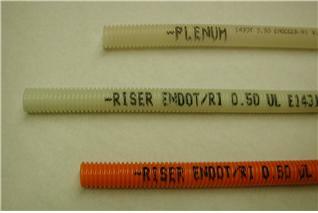 Endocor/PL Plenum Innerduct Flexible Optical Fiber Raceway from Endot. Meets the requirements of Underwriters Laboratory Standard Test Method No. 2024 (version of UL-910 for plenum raceways). PACKAGING - HAND COILS of 250 ft. & 500 ft.
UL 2024, sec.8 1.50 ft. Note: The use of Plenum Raceway does not eliminate the need for Plenum rated cable.